Just to the left of the tapestry. Hi! 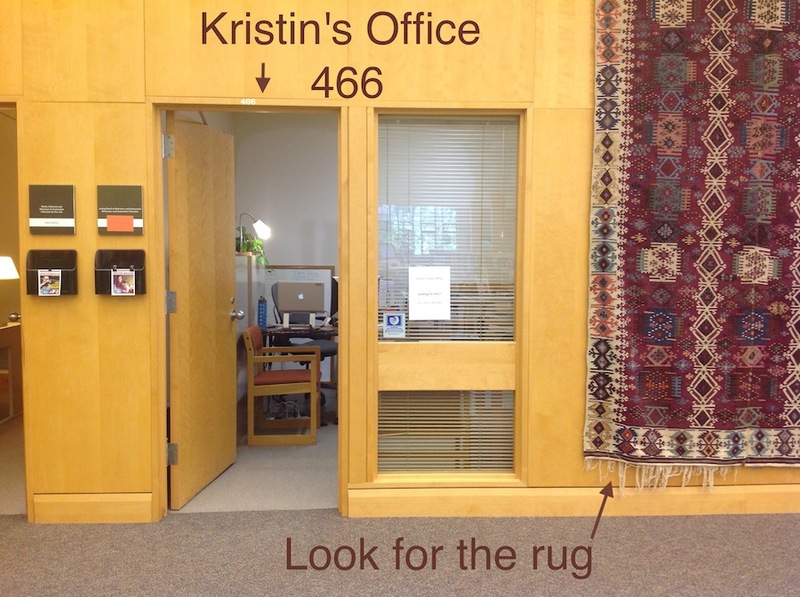 My name is Kristin and I am so happy to be your liberal arts advisor. I'm looking forward to getting to know you. Conversations outside of advising days are welcome - and a great idea. Email is fine for short exchanges, but do know that I'm happy to meet in my office or over coffee or lunch. Contact me and let's make plans. Drop by my office any time. My free/busy schedule will give you a sense of whether I'll be available. A wise student makes use of the variety of support available. Taking advantage of the rich support services at Carleton is not a sign of struggling - it is a sign that you know how to use the resources suited to your task. These services and more will be important at different times to thrive at Carleton.